The charmingly decorated and furnished suites and common areas at Highlawn Inn provide the ideal ambiance for a vacation or a getaway to Berkeley Springs, WV; with that special someone. Our dining room features elegantly adorned tables seating two, providing an intimate dining experience in our roomy Victorian room which can also serve as a lounge, perfect for visiting with guests for games, cards, or relaxing with a book by the fireplace. At breakfast, Sandy will be creating tempting and delicious aromas that waft from her kitchen, enticing guests to our delicious breakfast. During your stay, help yourself to cold or hot water from our famous mineral springs with international coffees or an assortment of teas.Explore the nooks and crannies here, and you will find distinctive treasures that are traditional to Victorian houses. We know you will find our inn to be a wonderful alternative to local hotels. 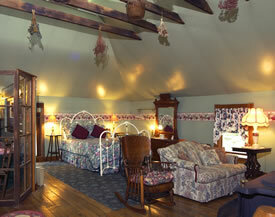 Five rooms comprise the main house, all with private baths, one with a whirlpool tub. 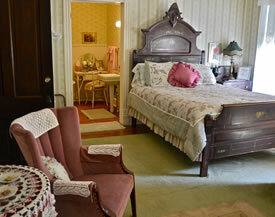 All rooms are beautifully appointed with antiques and special touches. Continuing the warm and cozy decor of the main house, this building, just down the walk, contains four guestrooms, two on the second floor, two on the first floor. All rooms have private baths, one with a whirlpool and fireplace. Located just behind the main building, this large luxury cottage is very private and spacious, featuring original exposed beams, skylights and a restored hay door. A large whirlpool is sited so that the flames in the fireplace may be enjoyed. 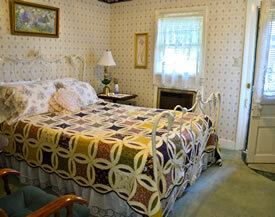 For a memorable vacation or spontaneous weekend retreat in Berkeley Springs, WV, stay in our B&B. Enjoy such amenities as color TV, air conditioning, fireplaces, and private baths – some with whirlpools. Every room in our buildings is non-smoking. Smokers may use the porches, only. All guests start their day with a filling, delicious breakfast. All rates are subject to change, verify rates when making reservations. Pre-payment of one night’s lodging guarantees the reservation. During most weekends and during holidays, a two-night reservation minimum is required but please call to see if a one-night stay is available. If you are reserving for the Apple Butter Festival, a three-night reservation minimum is required. Guests reserving dinner for special dinners get first priority for lodging reservations. Be sure to ask about current packages and specials for your getaway when placing your reservations. To cancel most reservations, you must provide notice three days in advance. To cancel reservations for more than two rooms or during holidays, you must provide notice one week in advance. If you cancel your reservation after these timeframes, and the room cannot be rebooked, your original reservation will be charged to your Visa or MasterCard. When you are paying by check/cash – your quoted rate is discounted 5%. When you are paying by Visa or MasterCard – your quote will be 5% higher. Sorry, the inn is not suitable for children under 14. We cannot accommodate pets, but you are welcome to visit with any of our two amusing cats including Little Girl, the resident kitty. Check-in time is 1-4 pm. On Fridays, we have a clerk on duty to accept check-ins from 1-7 pm. If your arrival will be later, please let us know so that we can make accommodations for your arrival.